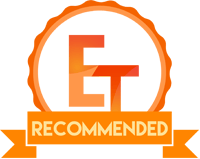 Today, we are back with another peripheral review for you guys. Peripherals are something I have grown to love over the past year or so as there are just so many makes and models with all kinds of different features. 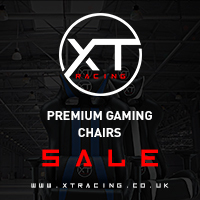 As Esports are getting bigger, more and more companies are now also jumping on board and making gaming related peripherals, which is great if you ask me. 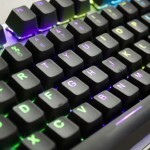 Gamers now have more choices than ever, there are a number of different switch types for keyboards and everything comes in a wide variety of shapes, colours and sizes. Another important thing for gamers to keep in mind is how many buttons will they need, will a standard mouse or keyboard do the trick? Or, do they need some extra macro buttons? Maybe they like TKL (Ten Keyless) keyboards which save space atop their desk? 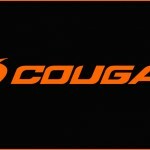 Either way, there is no denying the impact that Esports is having on the PC market as a whole. I remember not to long ago they said Desktop Computers were going to die, then PC Gamers stepped up and said, Nah, we ain’t having all that. 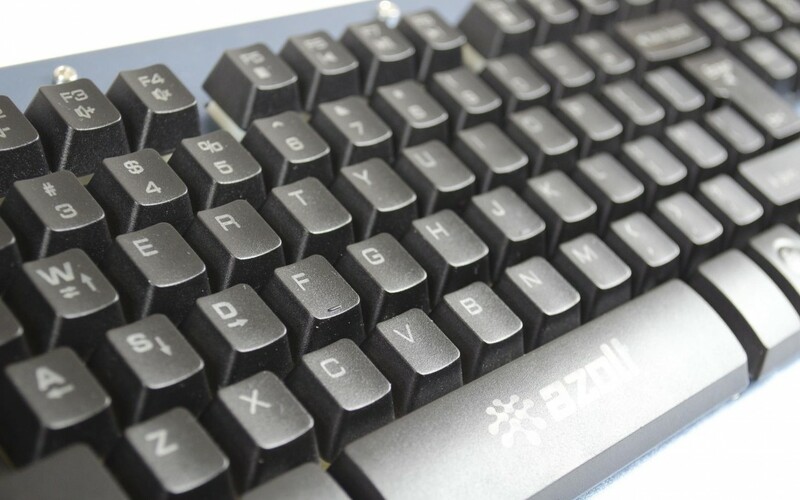 Today we will be taking a look at the Azolt gCrusader which is a half-mechanical keyboard that has some decent features and specification for the price tag. 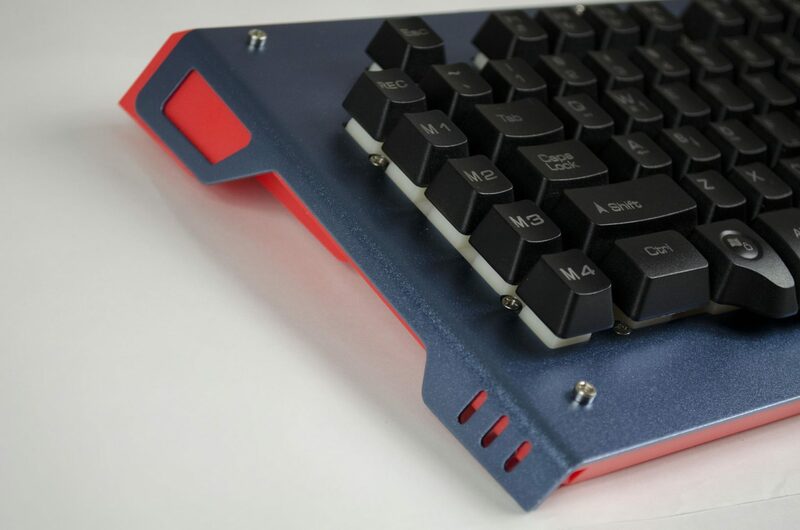 Now, I know what most of you are thinking, what in the world is a half-mechanical keyboard? 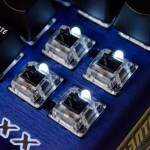 Well, from what I can tell, they have removed the plunger switches from a standard membrane keyboard and replaced them with a mechanical like switch, which would make it half mechanical. So to speak, there is still a membrane, just better switches, whereas on a full mechanical keyboard each switch is independently registered and there is no membrane per say. 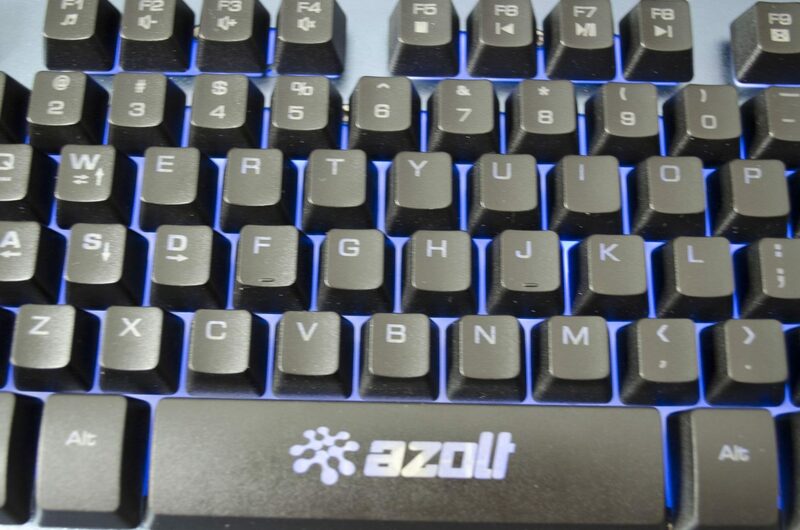 The Azolt gCrusader comes in either blue or black and alongside its half-mechanical nature, it also has some macro keys for which you can record the macros right from the keyboard, no need for software. 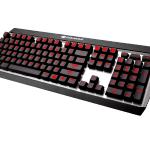 It has a life expectancy of up to 10m keystrokes and the backlighting on it can be changed between 3 colours, blue, purple and red. 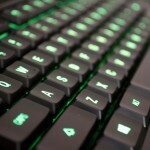 It also has one of the main features a gaming keyboard needs, which is the lock windows button. Using this, if you hit the windows key on the keyboard it will prevent it from allowing the start menu to open, which can be a life saver in game. Taking a look at the box first and it gives us a look at what the half-mechanical switch is made of. It also lets us get a look at the keyboard and tells us what some of the buttons do. 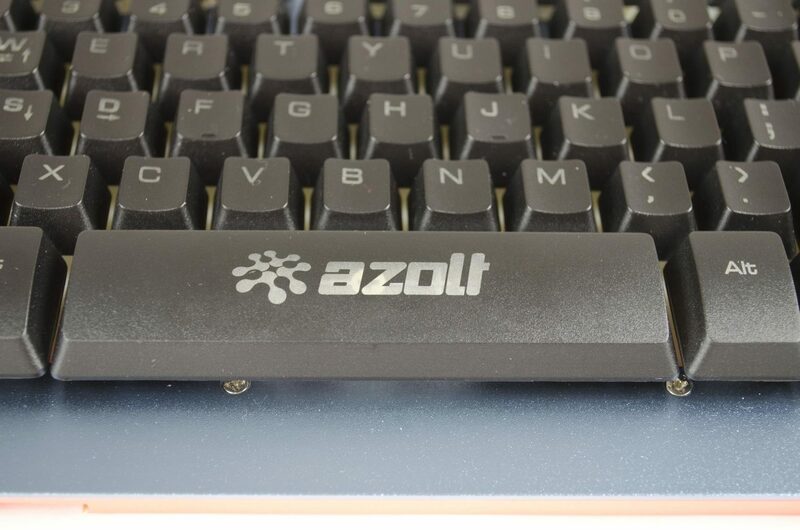 The Azolt gCrusader is definitely a sturdy and well-built keyboard, you won’t have to worry about breaking it unless you are really trying to. The top part of it is actual metal which is the reason for it being so sturdy. Another great thing about the gCrusader is the fact it comes with a removable wrist rest for those who like a bit of extra support. The wrist rest simply snaps into place and is easily removed if you don’t require it. 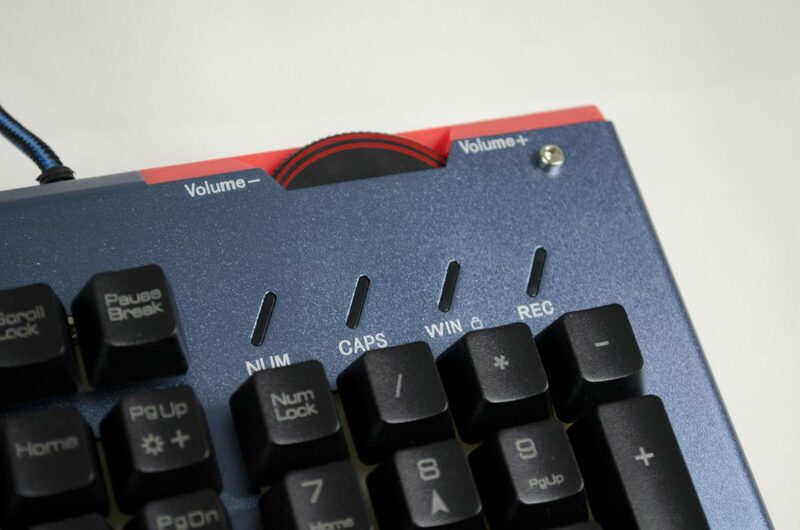 One of my personal favourite features on any keyboard is a volume wheel. Unfortunately on the gCrusader, they wheel doesn’t actually spin, but it’s more like a button you turn one way or the other to turn the volume up or down. Either way, I’m still glad to see a singular volume control, rather than trying to hit the FN key and a 2nd key for managing the volume. 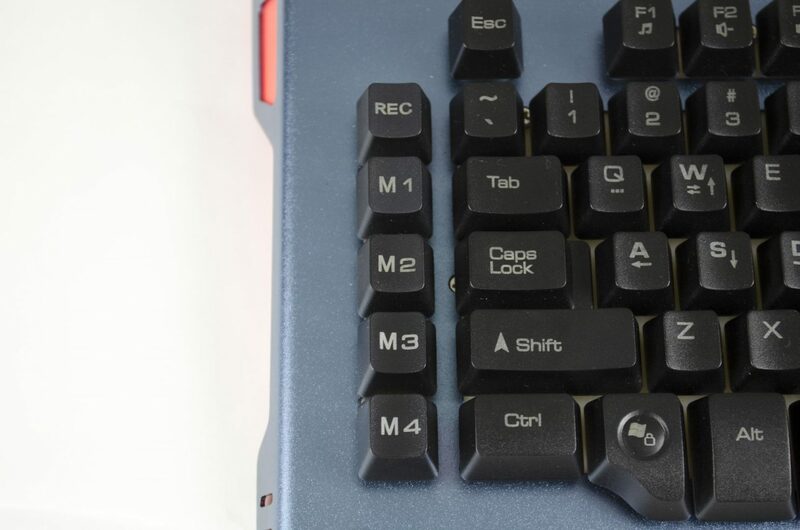 As mentioned, there are four macro keys for which you can record the macro right from the keyboard without the need for any extra software. On the sides, the blue metal overlaps the plastic underside and while it is hard to see, there is a bit of light that comes from the red plastic, not much just enough to notice when the lights are dim. 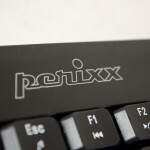 All the keys are laser etched as to allow for the backlighting to shine through with ease. On the bottom of the gCrusader, there are a pair of feet at what would be the top of the keyboard if you were using it. These are, of course, an ergonomic feature and one I quite enjoy, in the past couple of months I had one keyboard that did not have these and it was a bit annoying. Aside from the flip-out feet, there are also a pair of anti-slip pads so if using the gCrusader on a slicker surface, you shouldn’t have to worry about it sliding around when typing on it. 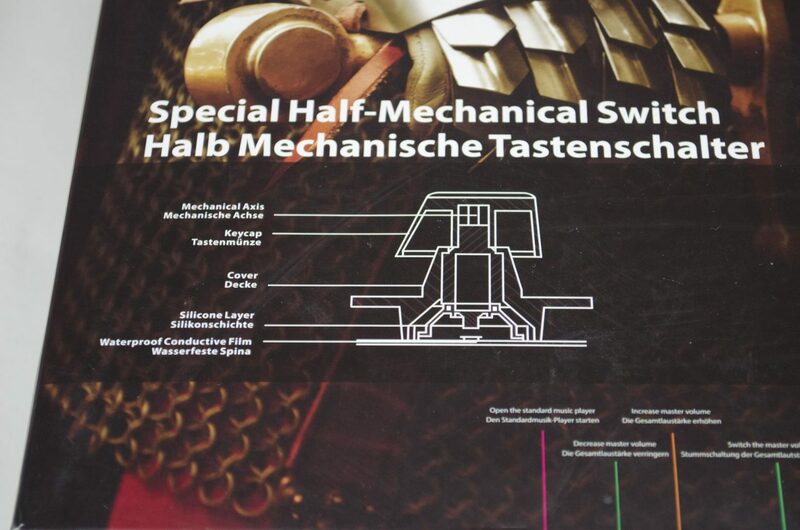 Here we get our first look at the half mechanical switch. 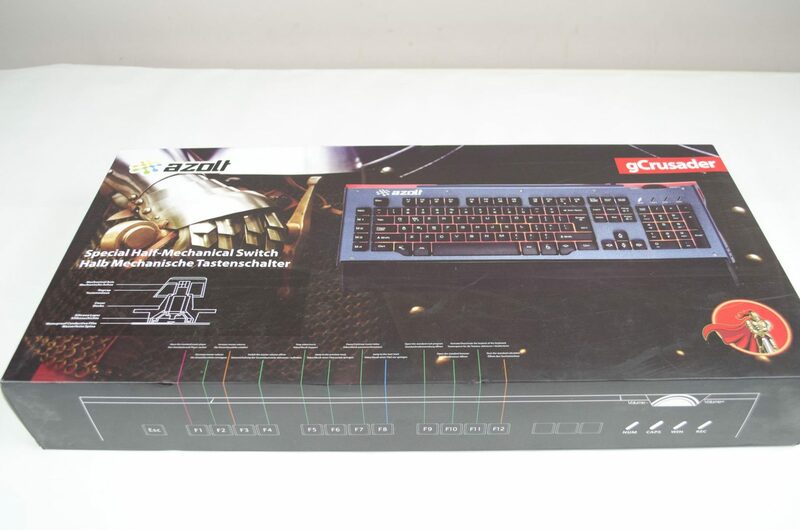 As you can see, they have what appears to be a mechanical switch, but they are all connected together and not individual as they would be on a fully mechanical keyboard. 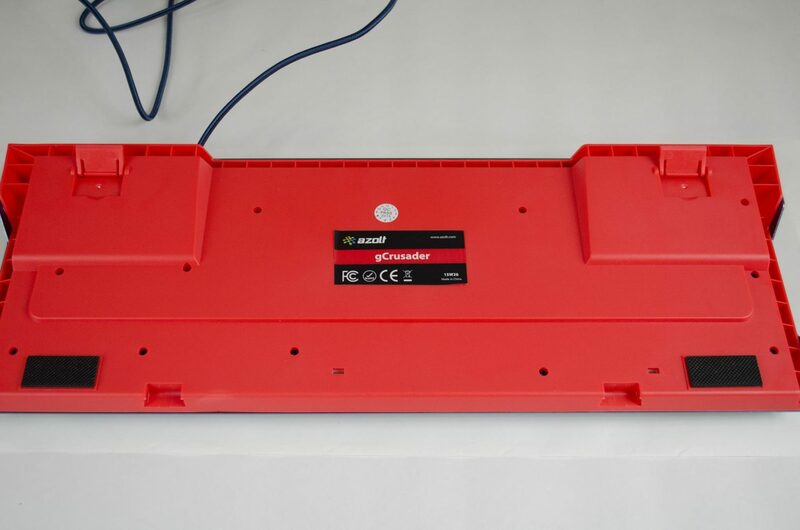 The gCrusdaer features a 3-colour backlighting system, there is blue, purple and red. 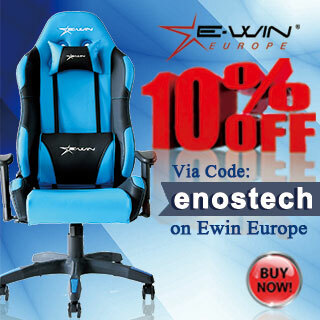 These can all be controlled right from the keyboard itself to allow for ease of operation and as to not require separate software to control them. Well, if I am completely honest, I was very skeptical about this whole half mechanical switch thing when I agreed to review the gCrusader from Azolt. However, I must say after 3-4 weeks of using it, I am quite impressed with what it has to offer. While it may not be fully mechanical, this didn’t really hold it back. This was, of course, where I was most concerned. I mean, how well does a half mechanical keyboard perform? Well, simply put, it’s not half bad. I had a chance to get used to it as a day to day keyboard first, browsing the internet and typing a few reviews on and it was great for this. I love a nice heavy and sturdy keyboard as sometimes I can get into typing an be a little rough with the keyboard. 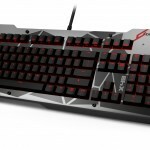 The gCrusdaer seemed like it was made exactly for this and I imagine it was, as being a gaming keyboard does come with the risk of being abused a bit. 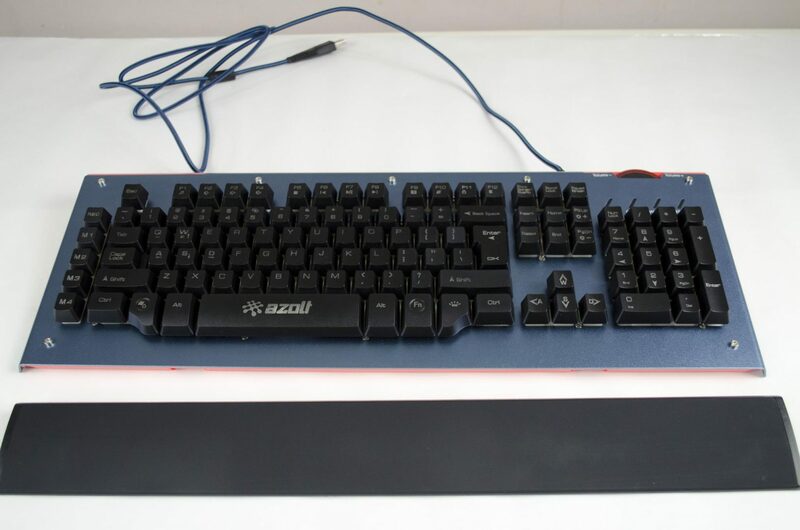 Typing on it was great and you can definitely feel the difference between this and a standard keyboard with plunger switches. 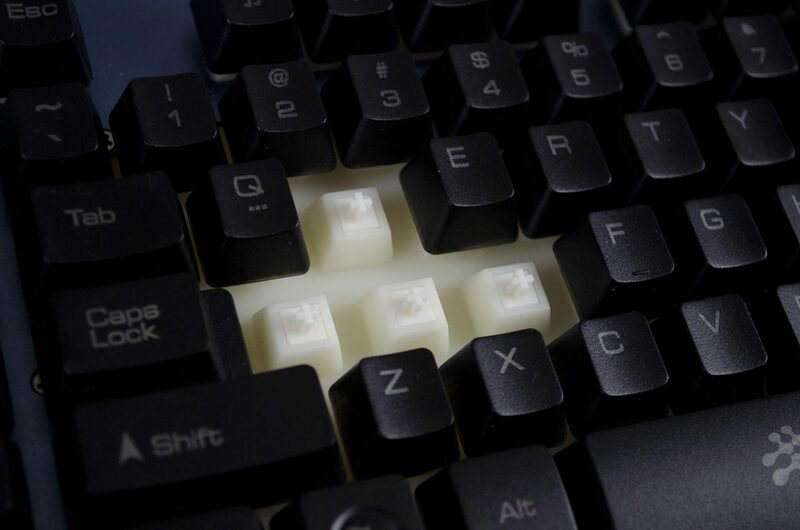 For one, it doesn’t feel like you are typing on a piece of rubber! After a couple of days of typing on it, I was more than ready to get in a game or two. Normally I would do this first but work seems to be going very good lately so I don’t get as much time to game as I would like. The first thing I loaded up was my trusty Black Ops 3 and got right to business. The responsiveness of the gCrusader was a bit better than expected and while I didn’t feel like I was properly on top of my game, I wasn’t far off. These half mechanical switches have what feels to be a decent actuation point to them and the feel is, again, much better than the plunger switch. I didn’t notice any real hiccups in my gaming due to the keyboard. There were no miss-clicks or missed clicks during any of my gaming sessions and while I could go on about how good it is, you really need to try it to believe. 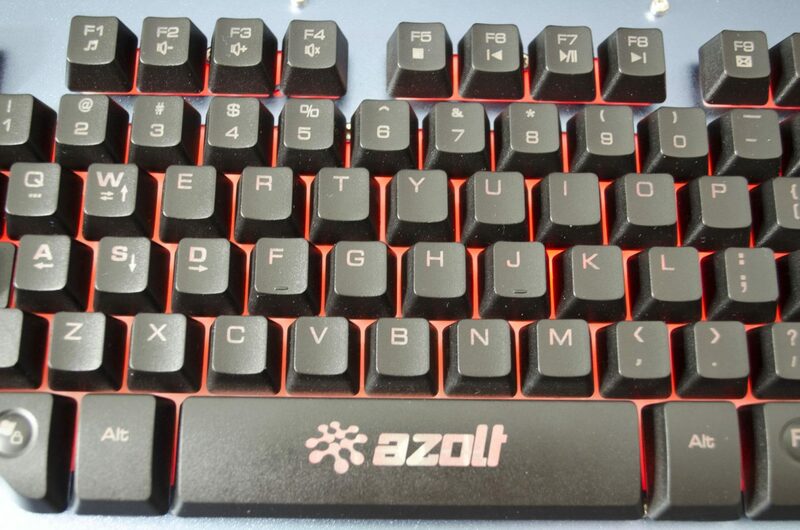 Please note, if you are used to fully mechanical keyboard, you may want to stick with those as while this is good for what it is, there is definitely a noticeable difference in the feel between the two. The overall design was quite pleasing. Let’s go ahead and put the half mechanical part to the side for now as while it can be considered a part of the design aspect, switch types do come down to personal preferences more times than not. From a sturdiness factor, the gCrusader is great, the metal top plate really helps to give it a feel of quality, which also makes it seem like it could take a bit of a beating. 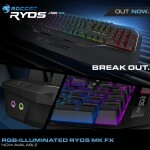 It comes in two colours, blue and black, each of which has three different colour backlighting in blue, purple and red. The overall aesthetic is nice and the addition of the volume button wheel is a big hit with me. Another thing to not forget is that it does come with four extra macro keys, which can all be set up right from the keyboard. The nice thing about these is they don’t make the keyboard much bigger than it would be normally and don’t cause any distractions for those not interested in using macro keys. This is what it all comes down to for me with the Azolt gCrusader, the value. 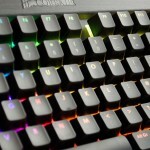 For just shy of £40 here in the UK at the time of review, this keyboard offers very good performance and while it is a classed as a gaming keyboard, it doesn’t have that cheap tacky gamer look to it. Azolt has done a great job at designing the gCrusdaer to be functional while remaining easy on the eyes and being affordable. When it all comes down to it. 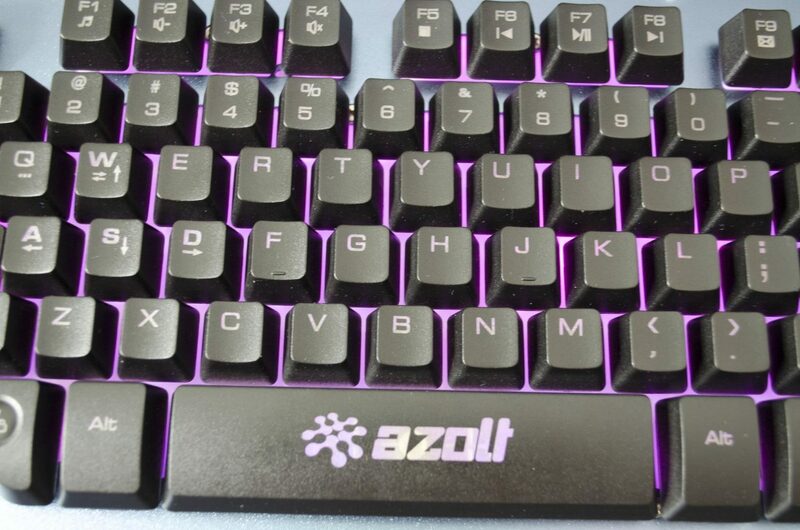 If you are looking for something better than a standard keyboard and are not sure you want to drop the money it would cost to get a full-on mechanical keyboard, than the Azolt gCrusader is a great mid-range gaming offering that won’t let you down. I would like to thank Azolt for sending in today’s review sample.